John Terry will seek to draw on lessons learned under former Chelsea captains Marcel Desailly and Dennis Wise when he leads England against Sweden in a friendly at Wembley this evening. Terry's career has been littered with controversy, but allegations he racially abused QPR defender Anton Ferdinand, younger brother of England colleague Rio, are some of the most serious the Chelsea stalwart has faced. They are the subject of Football Association and police inquiries, and although Terry has strongly denied the accusations, he was prevented from discussing them by FA officials at the team's hotel on Monday. He was still keen to front up and justify the continuing faith of England manager Fabio Capello, who has repeatedly insisted his decision to rest the centre-half from last weekend's 1-0 friendly win over world champions Spain was in no way related to the racism allegations. "The easy thing to do would have been to step away from it," said Terry. "But I am here, fronting it up and dealing with it today. Unfortunately I can't speak - we all understand that with the police and the FA. I can't speak about things. 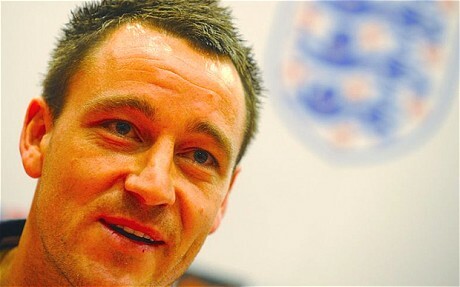 But I'm here and I'm very proud to be England captain. I'm not someone to hide away." There's no denying the England captaincy means plenty to Terry, who has regained the post from Rio Ferdinand having lost it for the 2010 World Cup following allegations he had an affair with the former fiancee of ex-Chelsea teammate Wayne Bridge. Now Terry is looking to the example of two Chelsea mentors in French great Desailly and England firebrand Wise, who were certainly strong characters in their own right, to help him through his latest off-field controversy. "They were two big characters - Wisey more so on the pitch and Marcel with how he dealt with things in the dressing room," Terry said. "I look back at Wisey and Marcel and they made sure they were on it every single day and they made sure everyone was on it with them. I feel as though I've learned from them."